Glioblastoma is an aggressive brain tumor that affects an estimated 12,000 people per year, with poor overall prognosis and long-term survival rates. Northwestern Medicine scientists are at the forefront of leading-edge investigations to discover the roots of glioblastoma’s origins, and to pinpoint innovative new treatments to attack this deadly disease. Scientists discovered the regulatory role of the enzyme CDK5 in an aggressive form of brain cancer and successfully halted tumor growth by inhibiting it. 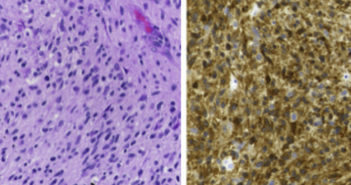 A Northwestern Medicine study, published in the journal Cancer Cell, has provided new insights into a mechanism of tumor survival in glioblastoma and demonstrated that inhibiting the process could enhance the effects of radiation therapy. 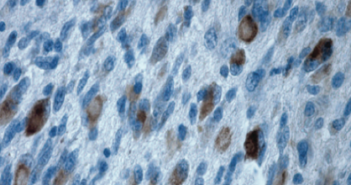 Scientists used a new approach to identify a promising therapeutic target for glioblastoma, which was previously overlooked in traditional approaches. Northwestern Medicine scientists have demonstrated that an enzyme called IDH1 plays a significant role in cancer progression and may be a target for novel drug therapies. An investigational neural stem cell therapy that works with a common cold virus to seek out and attack malignant glioma is being tested at Northwestern Medicine in a phase I clinical trial. Northwestern medicine scientist have shown how a medical device that delivers alternating electrical fields in addition to traditional chemotherapy can improve survival for patients with glioblastoma. But in the study, more than twice as many patients were alive five years after getting it, plus the usual chemotherapy, than those given just the chemo — 13 percent versus 5 percent. "It's out of the box" in terms of how cancer is usually treated, and many doctors don't understand it or think it can help, said Dr. Roger Stupp, a brain tumor expert at Northwestern University in Chicago. He led the company-sponsored study while previously at University Hospital Zurich in Switzerland, and gave results Sunday at an American Association for Cancer Research meeting in Washington.